If you are a web nerd and have not heard of Zapier then you need to get out more (or stay in more and spend more time on the web). Zapier, for those who don’t know, is a service that triggers events and actions based on specific things happening on your website, in your inbox or with the apps and websites you use daily. Or as Zapier neatly put it, “A web automation app which can automate part of your business or life”. So you can, for example, automatically update a spreadsheet from an email triggered from Moodle, or turn new Moodle users into Mailchimp subscribers. Or post your RSS feeds and course updates to social networks. This blog post explores some of the things that are possible, please note, these are not ready made zaps, they are just ideas for you to consider when looking at Zapier and Moodle. 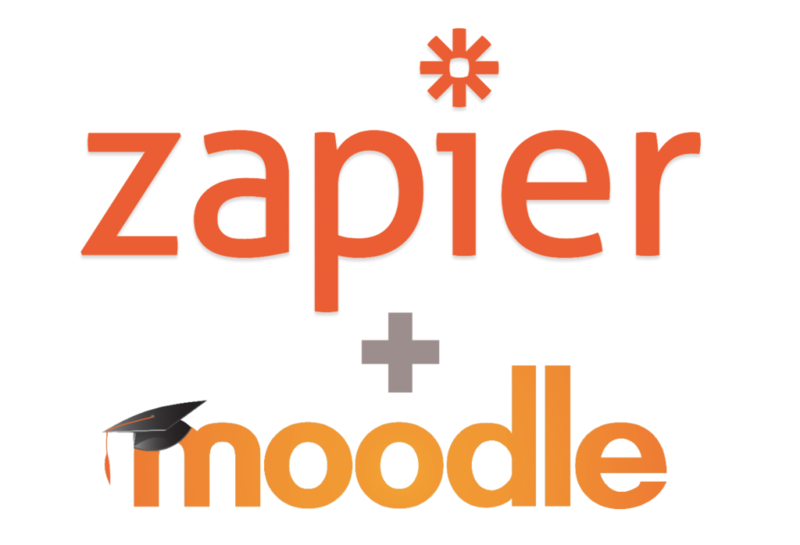 So how do we use Zapier with Moodle? There lots of ways to “zap with Zapier. RRS – useful for forums, glossaries etc..
Moodle , as many of you may know, has a neat feature called “Event Monitoring”. So when something happens within Moodle, it can send you an email which can, in turn, trigger a Zap. If you use Gmail, you can even add further filters for more flexibility. A note on Event Monitoring: Event Monitoring is awesome. You can set Moodle to automatically notify you when a resource on a course gets updated, when new content is added or when a new users joins the site, the possibilities seem almost endless. I urge all readers to brush up on Event Monitoring (https://docs.moodle.org/30/en/Event_monitoring#), it will open up your eyes to what’s possible with Moodle and Zapier. A Note on MYSQL – This requires the premium version of Zapier, and you also need to open up your firewall so that the 2 services can talk to one another. (Be careful here, perhaps consider using a secondary Moodle database for this, speak to your Moodle admin before doing this). So what are you waiting for, let’s get cracking. Here are some Cool Zaps Ideas for your next project. Send an update to Slack when a new course has been created so your team can get building the content. Tweet new RSS feeds that occur in Moodle (post to twitter each time a new glossary enter his added or forum thread). Turn new users into Mailchimp subscribers automatically. Automatically tweet when a new course resource has been added. Automatically post to Facebook any course updates or new content notifications. Send push notifications of new events via OneSignal. Turn forum subscribers into Mailchimp subscribers. Keep a log of how many items are in the new Moodle recycle bin. Thank a user for doing something in Moodle (via email, SMS or Push Notification Service). Create Google calendar events from rows in MYSQL – calendar entries. Build a custom Geckboard or other online dashboard from events (.i.e total logins, quiz attempts, failed logins, active courses). Receive an SMS Message when receiving a custom Event Notification such as an assignment submission.